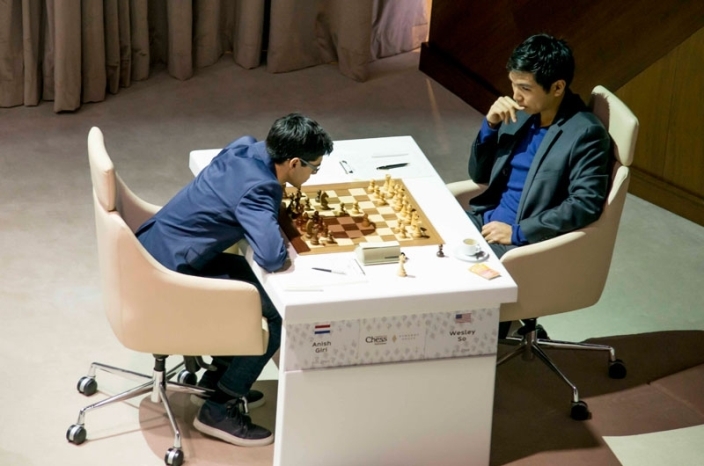 Wesley So crushed Anish Giri in the first round of Shamkir Chess 2015 to win his third game in a row since the forfeit loss in St. Louis. 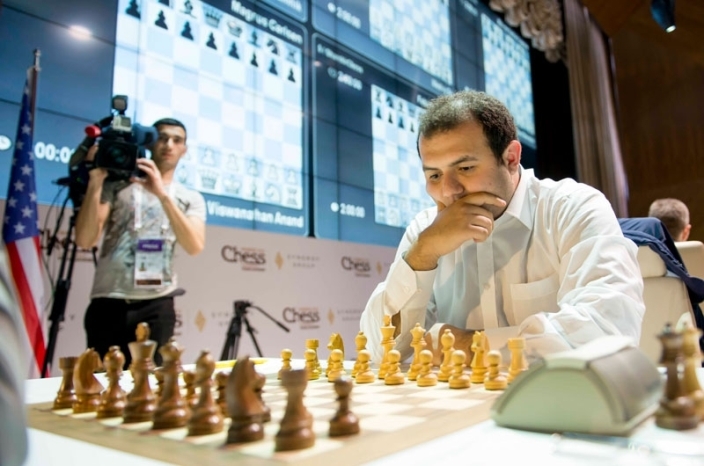 He was joined in the lead by Vladimir Kramnik, who kept his head in a time scramble against Michael Adams, but the big story of the day was Anand-Carlsen. The World Champion blundered a simple trap and needed all his tenacity to escape with half a point. Fabiano Caruana also suffered with Black, but was up to the task of defending a rook vs. rook and bishop ending. This year’s Gashimov Memorial has already provided us with great entertainment. 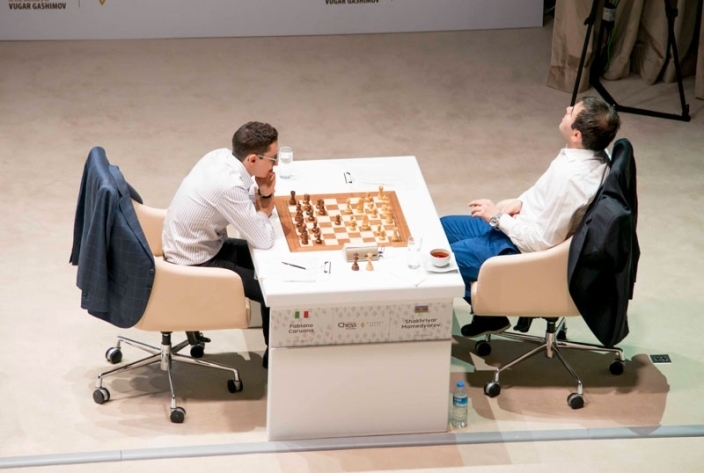 In the first round there were two wins, two thrilling draws and even the one uneventful draw was still mission accomplished for Azerbaijan’s Rauf Mamedov, who got off the mark with a comfortable 3.Bb5 Sicilian draw against French no. 1 Maxime Vachier-Lagrave, rated 111 points above him. That was the first game to finish, but the first real action was sensational. Magnus Carlsen continued his policy from the most recent World Championship match of playing fast against Vishy Anand, and seemed to have it all worked out with the new move 14…Bg6 in the Marshall Attack. Then, all of sudden, computers screamed out that he’d blundered with 19…Qd7? Not for the first time, they were right, and on this occasion Vishy didn’t overlook the trick. Instead, after 11 minutes’ thought, he whipped out 20.Nd5!, with the pretty point that 20…Bxe1?? 21.Nf6+! gxf6 22.Qxf6 will be mate on g7 or h8. It’s not pleasant to get such a bad position, and if he’d played 26.Nb4 the game would have had a different result. 47…Bxf3?? runs into 48.Kg6!, but Magnus wasn’t about to fall for a cheap trick for a second time in the same game. Instead he found the best move 47…Rc6!, which is the point where Anand later admitted, "I think I’ve messed it up". 48.Ke5 Bxf3 49.Nf5 followed and Carlsen again came up with the goods, playing 49…g5! 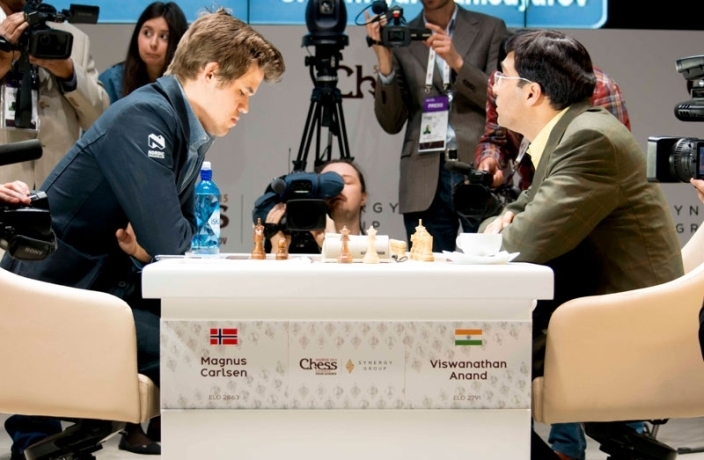 The advantage had gone, and it was perhaps good that Anand could almost immediately force the draw rather than letting his opponent emphasise the lost advantage - World Championship match style - by playing on. Caruana: "My mind just completely blanked"
It’s a huge line and I’ve spent a lot of time looking at it, but I just couldn’t remember anything. Maybe it’s a symptom of my long break from playing chess. My mind just completely blanked in the opening and I couldn’t remember a single move, which is pretty terrible. It was a difficult moment. I had very little time and I thought I might just slowly lose without any chances… I’m taking a lot of pawns and White is a little bit uncoordinated. Here I realised I was very close to just losing. At least there was no clear way to draw so I was just kicking myself. 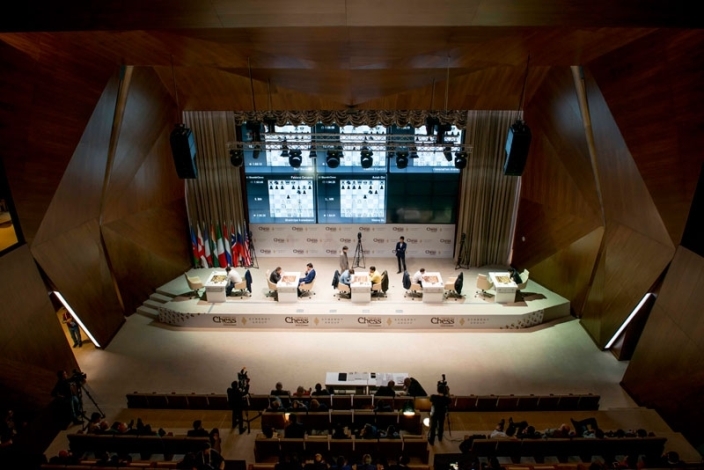 The theme of time was very much an issue in Kramnik – Adams as well, and it needs to be pointed out that the Shamkir tournament is unusual in having no increment until move 61. That makes time trouble a real threat to the players, though it's also great fun for us fans! Adams: "He still played quite a decent game and I didn't"
Kramnik identified 20…a5 here as a “tempting” mistake, and eventually in the play that followed he was able to round up the a-pawn and leave only his passed c-pawn on the board. 38.d4! with the idea 38…exd4 39.Ke2! and the king supports the pawn, was a nice logical end to the encounter, although Adams actually lost on time. We came on the same flight, so I guess we have the same kind of schedule. He still played quite a decent game and I didn’t – that was the difference. What perhaps does make it harder for Adams is that he was confirmed as a participant much later than the other players after the late withdrawal of Teimour Radjabov, so he’ll have had less time to hone any opening weapons. 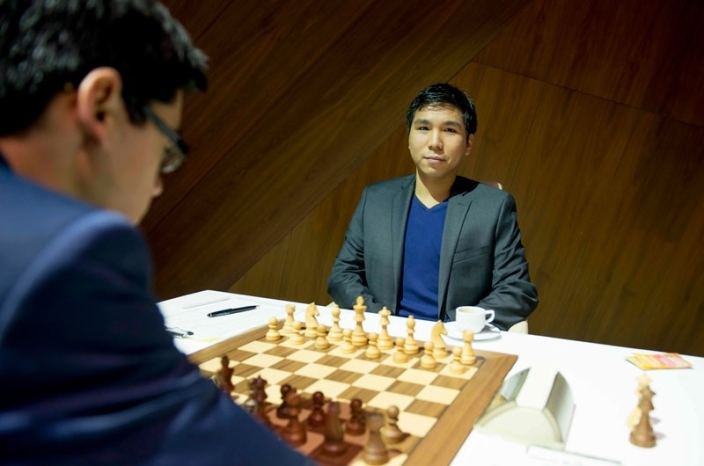 Wesley So: "I learned a lot from my losses"
I’ve just got to play my game. There were a lot of criticisms regarding that incident and my poor performance in the US Championships, so this is the best way for me to show that I fight every game and I just give my best. There are some people who don’t want to see you succeed. His Round 1 game against Anish Giri was truly bizarre. I spent too much time. I was considering resigning, but then I saw 7…Ne6 and the game went on. Anish beat me a lot in the past and they were hard losses. I learned a lot from my losses. Motivational scribbles may be a bad idea, but Wesley So is doing something very right! I think he’s a good player. I think he’s not one of the very best yet and he still needs to get more experience, but you can get far even at this level with a very good tactical eye and excellent preparation. That’s what he’s showing. He’s doing well. I think also the field suits him. I don’t know if he would be quite as comfortable playing more of the old guys like Vishy and Kramnik and so on. But by all means his result here speaks for itself. The moment to test himself against the “old guys” has arrived! As if we needed to add any more fuel to the fire, Evgeny Surov conducted a Russian interview with Kramnik today and asked about the forfeit incident. 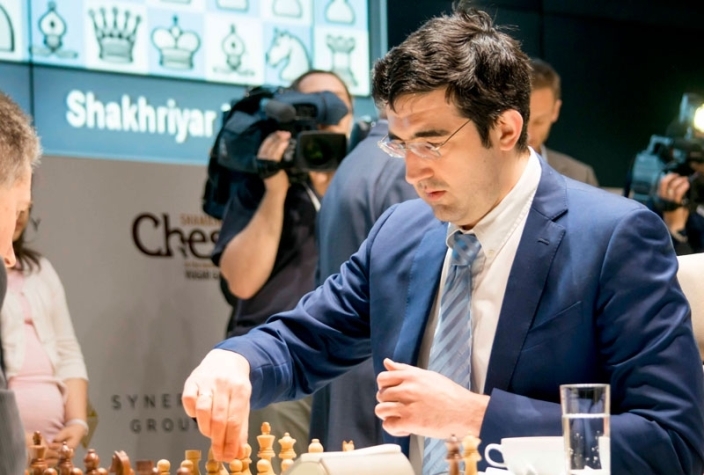 Although Kramnik called it "sad and ridiculous" and said he wouldn’t have been distracted or contacted the arbiter himself, he did side with the arbiter in enforcing the forfeit if warnings had been given. Of course Kramnik knows a thing or two about forfeits himself, since he was on the wrong side of the most famous one in recent chess history - during the 2006 World Championship match against Veselin Topalov. There’s no shortage of other action to look forward to, including Magnus Carlsen playing Mamedyarov, who he beat 2:0 in Shamkir last year. Don’t miss the show, live here on chess24 from 12:00 CEST each day.